SQUASH BLOSSOM the chow is multiplying and it’s getting hard to tell whether she is coming or going in this awesome Tshirt design which can be found on mugs and other merchandise at my zazzle store!!! !The abstract chows with impressionistic trees behind them look outstanding on black, dark brown, white, and cream garments. The pastel shirts (eg. pink, yellow, light grey) will show though the chow color a bit just so you are aware. 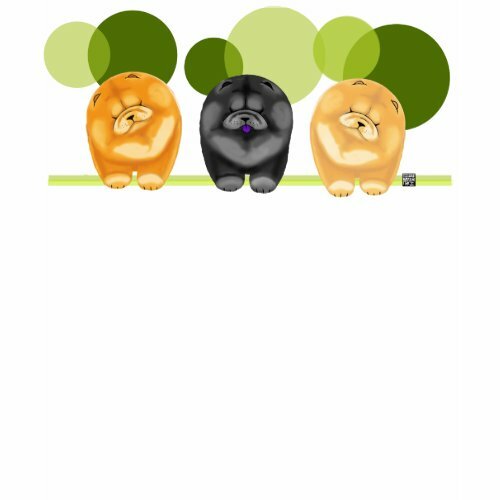 On the shirt fronts there are 3 chows coming attcha…..the back has 3 chow giving you the rear view! I hope you enjoy wearing this design as much as I did making it!! Great for both men and women and kids. You can choose from hundreds of shirt options on each product page. THANK YOU ALL SO MUCH FOR YOUR ZAZZLE PURCHASES. AS ALWAYS A PERCENTAGE OF ALL MERCHANDISE IN THE BAMBOO TEAHOUSE MARKET GOES TOWARDS A CHOW, PANDA OR MOONBEAR CAUSE. I BELIEVE IN GIVING BACK TO ALL THE ANIMALS THAT GIVE TO US SO MUCH!!! And last but not least…I wanted to show you an auction donation for a chow specialty coming up. I created Squash Blossom as a beautiful print which I overlayed on handmade Thai Mulberry paper, then attached to thick black cardstock which also serves as a mat when you frame her. The fused glass pendant matches the print exactly and is the crowning glory of this 3 part gift set. and Jewelry all in one! MORE OF THESE GIFT SETS WILL BE COMING IN THE NEXT COUPLE OF WEEKS FEATURING PANDAS, CHOWS, BINDIS…ALL SORTS OF WONDERFUL, COLORFUL SUBJECTS!! Your work is spectacular! I know she just got her new bird bead from you, but I haven’t seen it yet. I have a very small business, designing and making jewelry. My favorite is wrapping with ss wire. Oooh love the future mug! NEAT stuff!! Hello Julie Ann!! Thank you so much for stopping by the blog today!!! Oh that Bindi bird Kristin got is a doll baby!! I’m so excited to meet you!!! Please stop by the Bamboo Teahouse and start a page where you can show off your jools!! I’d love to see your work. I’m a native Minnesotan so its like meeting a neighbor in a way! Bloomington and Richfield are where I spent most of my time. M-S (the other comment) is from Minnesota too!!! Thanks Mary Susan !!!! This design just makes me laugh out loud! Come by often after September 18 and follow our trip to Egypt via the blog. I love to read everyones comments on my posts so far from home!!! Is the Pride of the Orient a picture of Cairo??? It looks just like her. so of course I love it. She sends you Chow kisses. You know your girl!!!! Yes, thats Mz. Cairo. Remember those photos I took of her at Rebeccas about this time last year? I used them for reference to do the painting from. I love her mug!!! Give Cairo a big purple kiss from us too!!! I can’t stop thinkiing about how great that painting of Cairo would look on my wall. Do you have it available as a larger painting?